Bell peppers were on sale recently and it’s one of the vegetables my kids love. 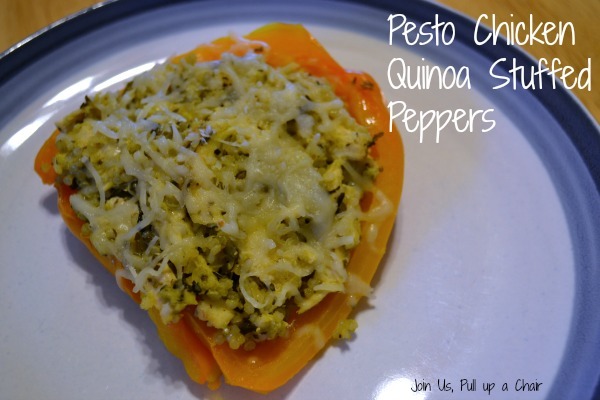 I was going to make regular stuffed peppers or stuffed pepper soup, until I came across this recipe for Pesto Chicken Quinoa stuffed peppers. YUM!! I love that these were packed with chicken and quinoa and pesto was a nice change from my regular recipe. I served these with a side salad and it was the perfect dinner. They were great for lunch the next day too! Using your oven’s broiler, broil the peppers on high for five minutes until the skin blisters and starts to turn black. Remove from oven and place in a large ziplock bag to steam the skins off. Preheat oven to 350 degrees.While the peppers are resting, mix together the chicken, 1 cup of mozzarella cheese, quinoa and pesto. When the peppers are cool enough to handle, remove the outer skin and slice each one in half. Remove the seeds and membranes. Stuff each half with the chicken quinoa mixture and place on a baking sheet. Continue with the remaining pepper halves until all the stuffing is used. Top each one with cheese and bake for 10 minutes.